Chump change is laying all around The Yellow Studio. Small, insignificant, trivial amounts of money. I’ve got a piggy bank with nothing but pennies inside. I’ve got a bank bag with nickels and dimes. There might be a stray quarter or two. Hard money. That’s the literal meaning of chump change. But if you have a habit of throwing loose change – your hard money – into a collection spot of some sort (I use the aforementioned bank bag), then you just do it without thinking about it. My dad’s generation carried their change in their pocket. And rattled it around with their hands when they were fidgety, too. Every evening he’d dump out the contents of his pant’s pockets on his dresser. There was always a pocket knife, his change, a lucky buckeye and maybe even a silver dollar (another lucky memento). I never carry change. I don’t know any man who does. I’m not sure why. Maybe because our change won’t buy anything any more. Nobody uses a pay phone so we don’t need it for that. People don’t read newspapers so we don’t need it for that. You can’t buy coffee or a soda for under a buck. But the chump change morphs over time. It compounds. Silently. Without fanfare. You just forget about it. Except to make deposits. That’s the key part of the habit. Like my dad dumping out the contents of his pant’s pockets, I walk inside the studio and immediately put loose change into the bank bag. Pennies go into the piggy bank. That’s the habit. I don’t know when this current collection started. It was awhile back. I’m thinking a year ago. Maybe longer. One piece of gear inside the studio went down. The factory will refurbish the unit for me for $85. For some reason I started thinking about that bank bag and wondered how much money might be in there. So I grabbed it and started going through it. Seventy six dollars and fifteen cents. So I’m within $9 of covering the cost of repairs to my gear. All from chump change. Proof that the chumps don’t keep their change. 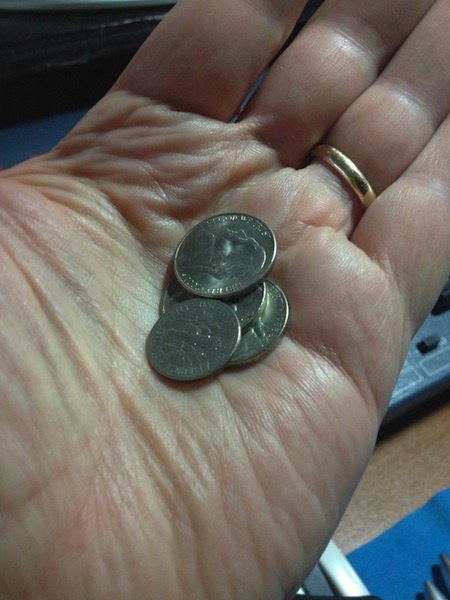 Trivial, or seemingly trivial little daily habits add up…just like the chump change in my bank bag. It’s not about extracting it. It’s about depositing it. What are you depositing every single day? What habits are you compounding every single day? There’s coming a day when you may need the cumulative total of those deposits. For me, I’m using that money to make a major repair on a piece of audio gear. That daily habit of reading has a payoff. Or the daily habit of writing. Or the daily habit of hugging your wife. Or the daily habit of reading to your kids. It all adds up…and it can end up defining your life.